So Tumblr removed its RSS feed import functionality a week or so ago, and decided not to tell anyone. I noticed this a week ago too, when I was frustrated with the lack of data portability with my Flixster ratings, but realised I can pull them into an RSS feed, and thought, hey, I’ll just start pulling them all into a Tumblr blog on the side, and every now and then, use my main Posterous blog for a longer review. 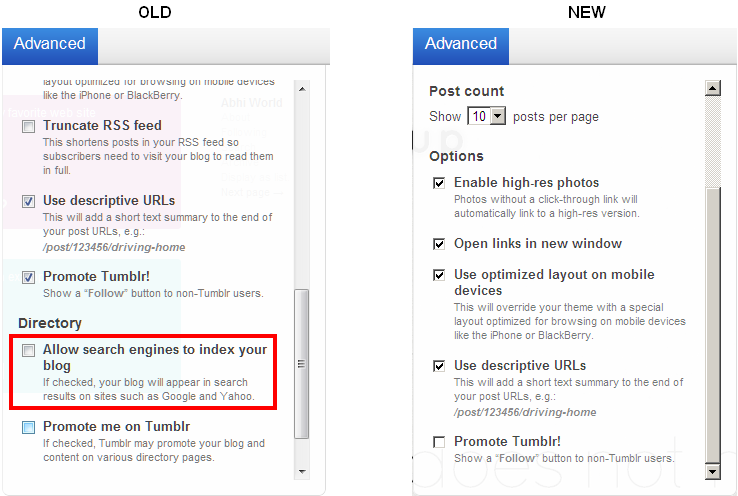 I googled it, and it seemed simple enough, with lots of posts around importing RSS feeds, but for the life of me, I couldn’t find the option in the dashboard, and then searching Twitter, came across puzzled old Tumblr users wondering why their blogs are no longer being updated, and new ones wondering why they can’t import feeds. The puzzlement has turned into exasperation now that they’ve realised the feature has simply been removed, without any communication from Tumblr. I see… That feels like a complete cop out to me, and more importantly, pathetic communications on their part. I know I tweeted @tumblr, and many others did, but clearly their Twitter account is just to show off features and not communicate with their users. → My Sydney Film Festival 2011. 15 seen. Senna takes the checkered flag. @Kathy: Ouch. Failing on multiple levels… I’d really hope they release a statement on their blog sometime soon explaining this all in more detail. Hi, Amy — you said on July 5 (on your tumblr – http://amysteen.tumblr.com/post/7278760586/tumblr-rss-feed-import) that you figured out how to stop the RSS import. It’s interesting that yours were still importing, since there are lots of us whose imports just stopped. <pause> Fascinating! Mine have started up again — c0uP have you checked yours? @kathy: I never had a Tumblr with RSS imports to begin with, so I don’t think I’ll ever be able to do it! This happen few months ago, and I just notice it today because I login to tumblr and found out nothing is updated on my tumblr page. Too bad that they disable this great feature. No wonder less people use tumblr nowadays. It is still possible to let your tumblr site read an external rss feed, you can use the tumblr api. There is also a site which will automate this process, but I don’t know which site. But if you’re able to code against the tumblr api with php you will succeed, it is not that hard for a php developer.